I love summer and will even say it is my favorite season, but one thing I hate about summer is mosquitos. Just looking at them flying around makes me itchy! So when PIC Pest Free Living, a NJ based family owned business, contacting me about doing a review and giveaway of some of their products, I was super excited! While PIC also sells products for repelling rodents, flying insects, roaches, and ants, luckily the only problem I have is the mosquitos. PIC was kind enough to send me 3 of their products – Mosquito Repellent Lanterns, Citronella Lanterns, and 2 Bugables Mosquito Repellent Bands. 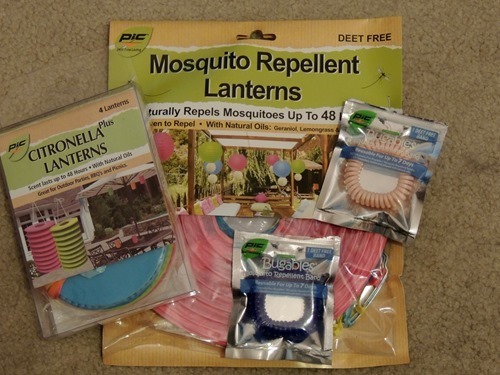 The Mosquito Repellent Lanterns naturally repel mosquitoes for up to 48 hours, are Deet free and contain natural geraniol, lemongrass, and citronella oils, and come in a package of 3 lanterns. The Citronella Lanterns are similar, but are shaped differently. They also repel mosquitoes for up to 48 hours and contain natural oils. They come 4 to a package. Both products come with cute ribbons to tie them up and I love the colors. I plan to use both types of lanterns for the Sukkot holiday, when we do all of our eating outside! The Bugables Bands are very cute and were very attractive to my kids, who all wanted to wear them to the fireworks on July 4th. “Bugables work by emitting an aura of all natural, plant-based essential oils. This scent masks the odors humans emit that attract insects effectively making you smell like a plant and invisible to insects.” I wish we had this when Zachary was at Cub Scout Camp – he came home covered with mosquito bites! They worked perfectly at the fireworks! PIC has offered to giveaway a sampling of their family friendly products to one of my readers! 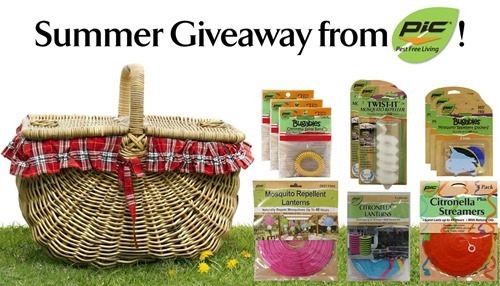 As shown in the photo above, the winner will receive Bugables Bands, Mosquito Repellent Lanterns, Twist-It Mosquito Repellers, Citronella Lanterns, Buggables Stickers, and Citronella Streamers. The giveaway will not include the basket. Please use the form below to enter!